#13 RB Shadrick Byrd (Thompson) scoring a touchdown against Mountain Brook Friday night. Thompson has been throwing the ball most of the season but decided to use the run game and it was the difference in this game tonight. "These two teams are very even," said Warriors head coach Mark Freeman. "We had a little bit of advantage, but give our guys credit for coming out and playing well. We played a great team. We had a good plan coming into the game. Give our defensive coaches credit for a great game plan. We have to run the ball. To play in November, we have to run the ball. Good football teams during the playoffs run the football and I thought we did that tonight." With the Thompson win over Mountain Brook, Thompson, Hoover, Hewitt-Trussville and Mountain Brook are 5-1 in Class 7A, Region 3. Mountain Brook will play Hoover and Hewitt-Trussville will play Thompson next week to shake out the seeding for the region along with the region title. Run the ball Thompson did as they rushed for 214 yards rushing and 149 passing yards. Byrd led the Warriors with 110 yards on 22 carries and the three touchdowns. Jarrett Crockett added 71 yards on 13 carries for the Warriors. The Warriors defense held Mountain Brook to only 163 total yards. Thompson (7-1, 5-1) scored first in the game on a Byrd 2-yard touchdown run. WIth 9:33 left in the first quarter, the Warriors led 7-0. 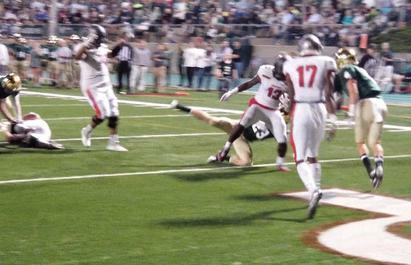 A Sam Reynolds fumble recovery deep in Mountain Brook territory setup the Thompson touchdown. With 3:49 left in the first quarter, Sam Higgins scored on a 9-yard touchdown run and Mountain Brook tied the score at 7-7. WIth 10:03 left in the second quarter, Taulia Tagovailoa found Mike Pettway on a 8-yard touchdown pass in the back of the end zone to give Thompson the lead they would not give up. With the extra point, Thompson led 14-7. With :46 seconds left in the half, Evan McGuire kicked a 28-yard field goal and the Warriors took a 17-7 lead into halftime. "We came together and played like a team while working hard all week," said Warriors linebacker Will Conner. "I love when we can come on the road and get a win in a big atmosphere like this." With 3:17 left in the third quarter, Byrd scored on a 8-yard touchdown run and with 11:11 left in the game, Byrd scored again on a 4th and one play for his third touchdown of the game. "When teams drop eight on defense, we need to run the football more and help the offense out," said Warriors running back Byrd. "The O-line keeps working hard, the running back keep working hard so were getting better running the football as a whole and that is going to be important in future games. This was a big win for us." Up next for Thompson is to host Hewitt-Trussville, while Mountain Brook will travel to the Hoover Met and take on the Bucs.